I'm getting prompted to switch to a Microsoft account or update my Xbox Live information. What's up? I’m having a problem playing my game. How do I fix it? What do I do if I’m having trouble with a Daily Challenge? When I launch the game, I can't sign in to Xbox Live. Does this matter? I'm having problems purchasing items from Microsoft Store. What do I do? Where can I find the Casual Games community? You need a Microsoft account so that the game can save your progress data to the cloud. The Microsoft account automatically gives you an Xbox account, where your game data is saved. If you have a Microsoft account, just sign in to it from the game. If you don’t have a Microsoft account, see Create an account. If you want to change your Microsoft account email address, see How to change the email address associated with your Microsoft account. If you’re having trouble playing your game, try the following solutions. Note Before you restart, save your work and close any open apps. Select Power and then Restart. If you use automatic updating, you don't need to check for important and recommended updates. Windows Update checks for these updates and installs them when they're ready. If you don't use automatic updating, you should check for updates yourself at least once a week. We usually release important updates once a month. However, updates could be released at any time. Select the Start button. In the search box, type Update, and then select Windows Update in the list of results. In the left pane, select Check for updates, and then wait while Windows looks for the latest updates for your computer. If any updates are found, select Install updates. Note You might need to restart your device to finish installing some updates. Save and close all your files and apps before you restart so you don't lose anything. Open Windows Update by swiping in from the right edge of the screen (or, if you're using a mouse, by pointing to the lower-right corner of the screen and moving the mouse pointer up), selecting Settings, selecting Change PC settings, and then selecting Update and recovery. Select Check now, and then wait while Windows looks for the latest updates for your device. If updates are found, select Install updates. Read and accept the license terms, and then select Finish if necessary. If updating Windows doesn't resolve the problem, check for game updates. Here’s how to find out if you’re running the latest version of your game. Open the Store and sign in with the account you use to play the game. In the search box, type the name of the game. For example, type Microsoft Solitaire Collection in the search box. On the game detail page, the button will show Open if you have the latest version. If it shows Update, select it to update your game. 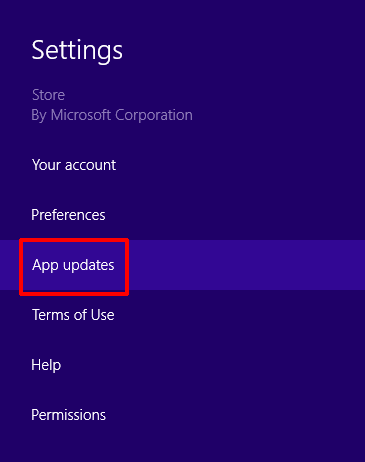 Alternatively, you can select your account icon in Microsoft Store (to the left of the search box), and then select Downloads and Updates to see if there’s an update available for your game. Move your mouse to the far right of your screen, or swipe in from the right, to show the charm menu. On the App updates screen, select Check for updates. If updating the game doesn't resolve the problem, uninstall and then reinstall the game from your device. Note If you don't normally sign in while playing, uninstalling the app will erase all of your games and progress. However, if you sign in to the game before you uninstall, your data will be saved to the cloud, and any saved games won’t be lost when you uninstall and reinstall the game. You'll be able to pick up where you left off in any game you're currently playing. On the Start screen, swipe in from the right edge (or, if you're using a mouse, point to the lower-right corner of the screen and move the mouse pointer up), select Search, and then type the game title in the search box. 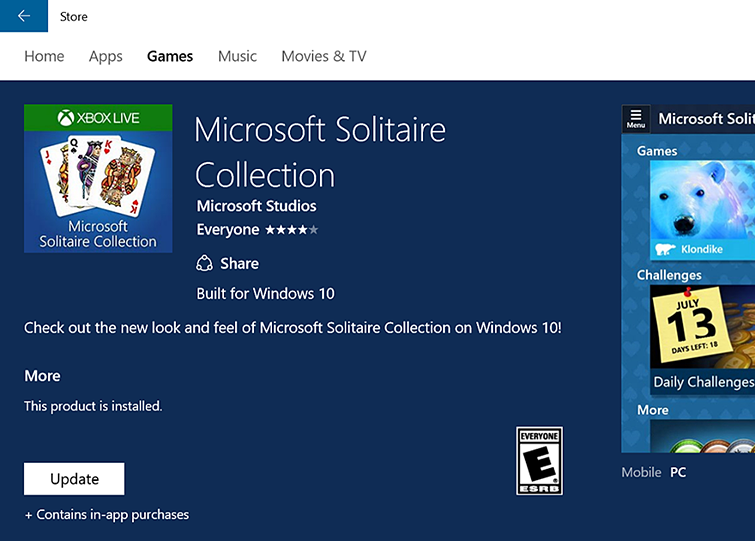 For example, type Microsoft Solitaire Collection in the search box. 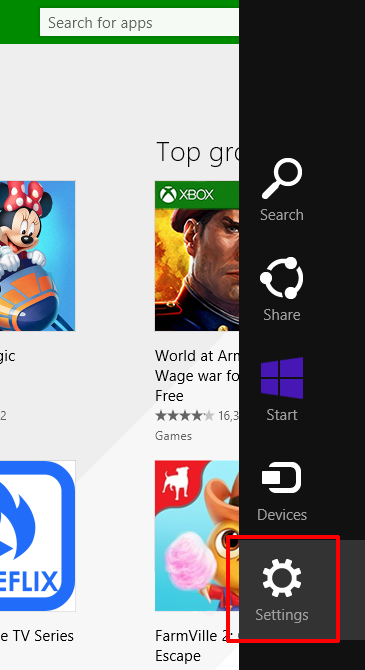 Press and hold (or right-click) the app tile, and then select Uninstall. In the Open box, type wsreset.exe, and then press Enter. Microsoft Store will open so you can reinstall the game. For Windows Firewall on Windows 10 or Windows 8.1, see Protect my PC from viruses. The steps to unblock the game (or any app that needs to access Xbox Live) will vary depending on the antivirus or firewall software you use. Refer to the documentation for your antivirus or firewall software to open the settings and make sure that the software is not blocking the app. If your antivirus or firewall has an app "whitelist," make sure that your Xbox Live-enabled games are on this list. If you need further help troubleshooting problems with a Microsoft Casual Games title, see Run the troubleshooter for Windows apps. All Daily Challenges are tested and guaranteed to be solvable, but sometimes even great players get stuck. Go to the Where can I find the Casual Games community? section below for details on how to find the community for the game you’re playing. Yes. This will prevent you from accessing your achievements, game progress, and other game data. All this data is saved in the cloud on your Xbox account, and if you can't sign in to Xbox through your game, you can't save your achievements and game progress. See Connecting to Xbox Live from a PC for troubleshooting steps. If you’re planning to be in an area with no online coverage, such as a long-distance flight or a sailing excursion, you can prepare your Windows 10 device to allow you to play offline. Note Microsoft Bingo requires an online connection. You won’t be able to play this game while offline. Go to the Apps & Windows Store support page. This page helps with common Store problems and includes options to request help. Would you like to contact Support regarding the "Microsoft Casual Games FAQ" issue you were reading about or a different issue?